More aster leafhoppers are carrying phytoplasm this year, so that could mean a jump in aster yellows. 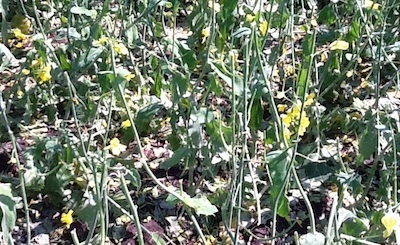 Sclerotinia stem rot risk may still be there even if it hasn’t rained. When spraying in high temperatures (> 25 C), check product labels or consult retailers or fungicide companies about results in hot weather. 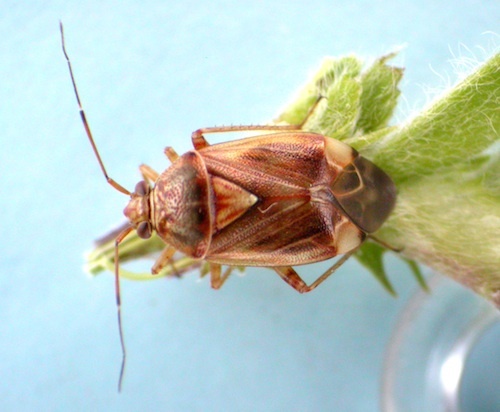 Late flower and podding stages are when lygus feeding causes the most damage…. 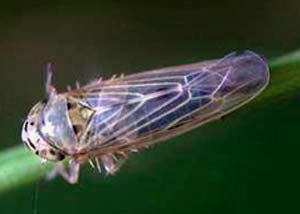 Missing pods are a sign of lygus damage, but missing pods can have many causes, including other insects, heat, excess moisture, and herbicide damage. What caused these droplets to form? 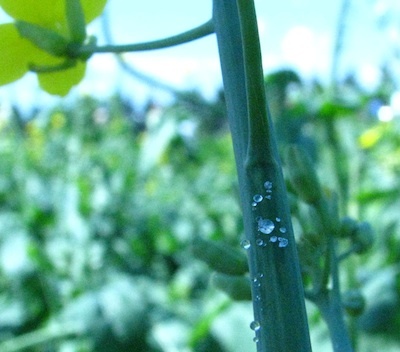 When it comes to the sclerotinia stem rot risk, moisture has a much larger influence than temperatures. Infection can be high in hot weather as long as the moisture is there. Moisture can come from rain, relative humidity in the high 80s, or morning dew. Our current economic threshold tables for lygus in canola may be too low when applied to current canola production systems across the Prairies. 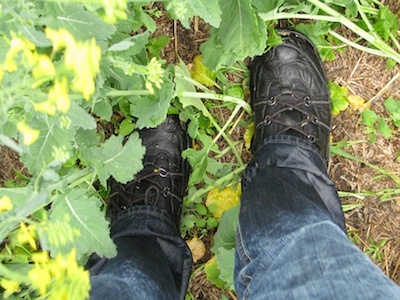 If a canola stand is healthy and growing fast, growers are reportedly doubling or tripling thresholds. Say the threshold is 10 per 10 sweeps, some growers are doubling that to 20 per 10 sweeps as the action threshold. Interestingly, a small amount of lygus feeding may actually encourage the plant to produce more buds. Leafhoppers are more plentiful and carrying more aster yellows phytoplasm this year, but spraying is rarely effective. Bertha counts are starting to spike in some locations. Cutworms are still feeding in some locations, but the threat should be over for most regions. Any stress can inhibit proper fertilization of the flowers. Common stresses included heat, drought, excess moisture, insects, herbicide damage, and nutrient deficiency. In many cases the cause may seem obvious, but it is often a good idea to investigate further to ensure there are no other contributing factors. Read more for events, including Canola Galla, Wednesday, July 25 in Brooks-Bassano. This hands-on field event is for agronomists, growers and all others interested in learning more about canola.